Just had to share a quick picture I snapped of the little sweet pea this morning. His hat just fit his head. 🙂 The girls were excited to see him and play with him and his little toys. I’m sure they will have fun today. 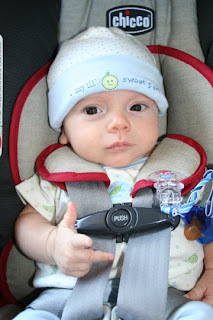 Looks like he’s giving a little, “wassup, holmes?” – very cool kid. Adorable picture! I am absolutely positive your lil guy will get a ton of lovin today!!! Oh my word ! How cute is that ?! Totally love the hand sign…..
Oh, I am quite sure they had a fabulous day! There is nothing like having a good friend whom you trust with your children…not only for peace of mind, but also to know that you’re passing on the legacy of the friendship for all the kids. I’m sure all had fun today! You may want to watch out and cover his head. Or, he could come back with a cruddy hair-cut. Blah, ha, ha, ha….I’m so totally kidding. She’s posted before about self-inflicted hair-cuts. I can laugh because my own daughter (who I KNEW WOULD NEVER EVER cute her own hair–chose to cut her hair in lieu of a punishment for sneaking gum into the church nursery during my choir practice.) Funny now, NOT funny then. She looked like Tina Turner when we left. Ouch. It was crazy. Anyway, I couldn’t help but warn you that Elias may come back with a choppy do. Ha ha. I’m so teasing….I have to poke fun….I think Angie is a doll and a true saint. I mean, good golly, her husband stood on the corner next to the “going out of business jewelry company stores and the little caesar’s 5 dollar hot and ready guys.” She’s got to be someone special! Ha ha. Your baby is so cute. Be glad over him and know what a treasure from God he is. Keep trying, girl! Have a great, blessed night. How cute. I am sure he will be in good hands. Kudos to Angie for doing this for you. What a blessing she is for you. What a friend. Have a great day everyone. My baby is coming home from college in a week and a half- YEAH!!!!!! Oohhhh is he precious! LOVE that hat! I miss those days. I used to put my little guy in them all the time and now that he’s a toddler he yanks them off, gives me a big stinkin’ grin, and says, “NO, NO, NO Mama!” Winter should be interesting….=o) Enjoy every minute of these tiny little cuddle bug days. I love Angie’s blog and I bet he ate up the attention from all those beautiful little girls!